Behind every picture-perfect gleaming clear swimming pool is a pool filter. Pool filters are so vital that using the wrong one is just as bad as not using one in the first place. This guide covers the types of swimming pool filters, how to determine flow rate and pool capacity, and what to look for in order find the filter that’s right for your pool. The basic types of filters include sand filters, cartridge filters, and diatomaceous earth (DE) filters. All three of these filters work well when set up and preserved correctly. The main differences between them depends on the efficiency of the filter as time passes. Upfront costs and the total price of upkeep is another factor to consider. Sand pool filters are the most commonly produced and used filter type. Sand swimming pool filters function just as well as cartridge and DE filters for the majority of purposes, yet on a microscopic level, sand filters do not operate as efficiently as the other types. Sand pool filters work by pumping dirty swimming pool water over the upper layer of sand inside of the filter. As filthy pool water permeates through the bed of sand, layers of pool-grade # 20 silica sand work to filter out pool pollutants. To clean the filter, pool owners have to backwash the system by reverse-circulating the pool water into the filter to purge it out. Cartridge pool filters are much more effective than sand swimming pool filters in a lot of ways. These filters function by filtering filthy pool water through a round fabric-like cartridge. These pool filters are much more reliable considering that they are easier to maintain over the long run. Essentially, all you’d have to do is remove the cartridge from the filter housing and also spray it down with water. On the other hand, washing these filters is much faster than clearing out a sand filter which must be backwashed on a routine basis. Confused yet? Let us help you select the right filter for your pool! DE swimming pool filters are the most expensive as well as most highly advanced of all filter types. The reason for this expense is that DE filters can sort pollutants as small as 1 to 3 microns in size. DE filters include grids which make use of diatomaceous earth powder, which looks like pale, ultra-fine sand. DE powder, however, is a much much better purification medium compared to silica sand due to the fact that the products are incredibly different on a microscopic level. Most DE filter owners wash the filters by hand a few times a year because DE filters are a lot more fragile compared to sand filters and can tear if they are not gently cleaned on a consistent basis. 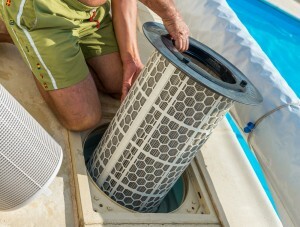 Most DE filter owners typically vow by them since no other filter keeps the swimming pool cleaner. Pool maintenance and repair professionals highly encourage swimming pool owners to pick a slightly oversized swimming pool filter. A swimming pool filter that is too small may trigger damages to the pool’s pump because the pressure inside can stress the pump’s electric motor. The key to choosing a large swimming pool filter is to match the swimming pool’s dimension to the filter’s flow rate. Swimming pool capacity is the amount of water a swimming pool holds in gallons. For a rectangular swimming pool, calculate the capacity in gallons by multiplying the width by the length by the average depth by 7.5. For a circular swimming pool, square the diameter and multiply that by the average depth and then by 5.9. The capacity of an oval swimming pool can be found by multiplying the full length of the pool by the width by the average depth and afterwards by 6.7. 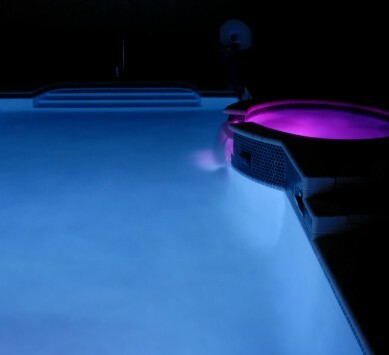 Since round and oval swimming pools are often above ground, their average depth is computed at 4 feet instead of 5 feet. Those with oddly formed pools need to call their swimming pool builder or swimming pool professional. Next, compute the flow rate needed in a filter in order to totally filter the swimming pool in an set amount of time (described as the “turn over”). For example, if a 20,000-gallon swimming pool has to be completely filtered every eight hours, the filter’s circulation rate has to filter at least 2,500 gallons per hour, which is 41.6 gallons per minute (gpm). Due to the fact that different filters have various circulation rates based on the filter location and the filter maker’s mentioned filter rate, the difficulty arises. The manufacturer’s filter rate (not to be confused with your preferred circulation rate) is the filter’s circulation rate for each square foot of area. Multiply the 2 numbers (provided by the vendor) to find the filter’s circulation rate and choose if it filters quickly enough your pool. For example, a filter with an area of 5 square feet and a filter rate of 10 gallons per minute will achieve a circulation rate of 50 gpm, which is certainly fast enough of a filtration process for the pool in the aforementioned example. Choosing a filter that has the fastest rate of circulation is a good idea, since the flow rate will steadily fall over time as the filter is used, and a bigger filter easily accomplishes a faster flow rate. When the right flow rate has been determined and you’ve decided on the type of filter you want, the last step is to compare various brand names and models of filters. Swimming pool filters of all kinds can be located at brick-and-mortar pool supply establishments and also online. When there is no method to review the seller’s online history, filters are often less expensive online but it could be tough to find a respectable vendor. Online retailers like eBay and Amazon offer product reviews and low prices that we’ve all come to expect when shopping online.